A majority of the existing Hindu temples in Pakistan are in a dilapidated condition due to indifference of the successive governments in Islamabad but another disturbing development has alarmed the country's marginalised Hindu community. 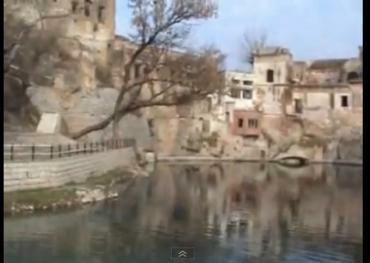 The sacred pond at Katas Raj temple located on a hill in the Choha Saidan Shah area in the Chakwal district of Pakistan Punjab is drying up at a rapid pace due to the large supply of its water to the nearby towns through tube wells. 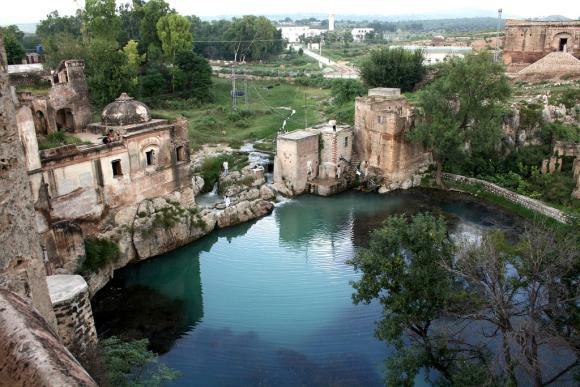 According to Hindu mythology, the pond at the Katas Raj temple in Chakwal has a mythical association with Lord Shiva; it was formed by the tears of Lord Shiva which he is believed to have shed after the death of his wife, Satti. The story goes that when Satti died, Lord Shiva cried so much and for so long, that his tears created two holy ponds -- one at Pushkara in Ajmer in India and the other at Ketaksha, which literally means raining eyes, in Sanskrit. It is from this name that the word Katas is derived. According to Hindu mythology once the Pandavas reached a lake and when they were about to quench their thirst, a Yaksha, the protector of the lake, appeared and said that only those who rightly answer his questions would be allowed to drink from the lake. The four Pandavas failed and were made lifeless by the Yaksha. Finally Yudhishtira was able to answer all his questions following which his brothers were revived. According to one legend, this dialogue took place at the Katas Raj Temple pond whose holy water is believed to have magical powers. 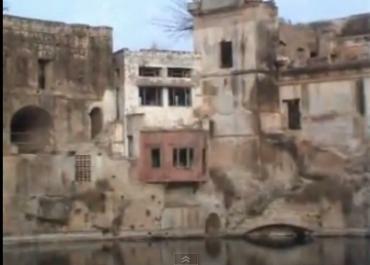 However, despite the Pakistan government's decision to nominate the Katas Raj temple complex for the world heritage site status, the setting up of several cement factories close to the temple site and the subsequent installation of several tube wells have reduced the water level in the pond. The water from the pond is being supplied to residents of Choha Saidan Shah as the Punjab government has failed to provide any alternative water facility to them since Pakistan came into being on August 14, 1947. Interestingly, the water supply to the residents of Choha Saidan Shah was sanctioned by the Punjab government on the condition that the water in the sacred pond would be maintained to a certain level. Katas Raj temple, dedicated to Lord Shiva, has existed since the days of Mahabharata and the Pandava brothers spent a substantial part of their exile at the site in Chakwal. Katas is mentioned in the Mahabharata, one of the three major ancient Sanskrit epics of India. According to the Hindu religious belief, the Katas Raj temple in Chakwal and the Pushkara in Ajmer Sharif are the eyes of Shiva. Paras Nath Jogi drew his last breath on Katas which holds great historical significance, being the place where Muslim scientist Alberuni attempted to measure the circumference of the Earth, studied Sanskrit and wrote his 'Kitabul Hind'. In fact, most of the temples, located some 40 km from the modern city of Chakwal in the Potohar region of northern Punjab in Pakistan, were built during the reign of Hindu kings. The existing chain of temples in Katas Raj was built around 900 years ago, although the earliest of the Katas Raj temples dates back to the latter half of 6th century AD. The Katas Raj temple in Chakwal was never abandoned by local Hindus when they migrated to East Punjab in 1947, unlike many other temples in Pakistan. Therefore, it has always been the site of holy pilgrimage. Even nowadays, through an agreement between the Indian and Pakistani governments, Hindu worshippers perform a pilgrimage to the Katas Raj Temple every year and bathe in the sacred pool around which the temple is built. According to the Hindu caretakers of the Katas Raj temple in Chakwal, there was no shortage of holy water in the pond till 2007. As Chakwal saw industrial development, three cement factories were set up in Choha Saidan Shah. However, the cement factory near the Katas Raj temple complex is posing a threat to the pond which is drying up rapidly. Despite giving a commitment to the Chakwal administration that they would arrange water for the factory from the Jhelum river, the factory owners installed many tube wells near the temple site. The abundant use of water in the factory has not only harmed the pond but also the nearby villages which are also facing severe water shortage. The residents of Waula village situated at the back of the cement factory were left with no other option but to get water directly from the holy pond. Currently, two water pumps are installed on both sides of the pond: one for Choha Saidan Shah and the other for Waula village. While the archaeological department of Punjab has already closed its eyes, the district administration of Chakwal argues that it has nothing to do with the affairs of the Katas Raj temple which is the responsibility of the Evacuee Trust Property Board. "We have nothing to do with the affairs of Katas Raj temples and the pond," said Assistant Commissioner of Choha Saidan Shah Abdul Majid, adding that the Chakwal district administration had provided utmost support to the Hindu yatris when they visited these temples. Similarly, Director General of the Punjab Archaeology Department Haroon Ahmad Khan also came up with the same version. "Archaeology department has nothing to do with the pond," he said, adding that they did not have any alternative but to get water from the pond for Choha Saidan Shah and the Waula village. "The public health department has got funds to provide water supply but it has done nothing," he further stated. Under these circumstances, not only has the sacred pond become a victim of officials' apathy but the ancient Katas Raj temples are crumbling. Expressing concern over the plight of the Katas Raj temples complex, the President of the Pakistan Hindu Council Dr Ramesh Kumar said, "The Pakistani authorities should take urgent steps to preserve the Katas Raj temples and the holy pond."